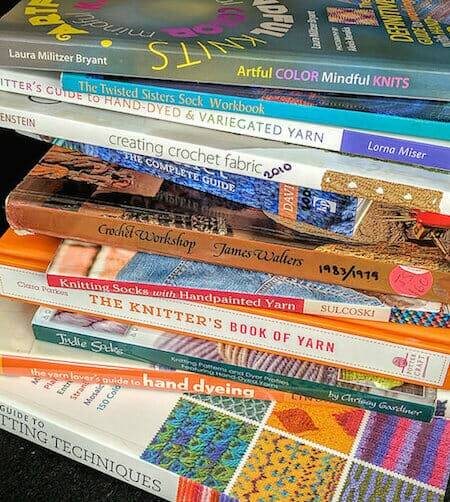 Back in January I read a stack of crochet books (and many knitting books) as research for my Stitch Games class topic. I welcome doing this, especially in January after the hectic holidays. It’s so cozy. I take notes as I read them. Then I set it all aside for a few months until I’m ready to look it all over and start writing the class handout. It wasn’t necessary that I do this kind of research for the other class topics this year (one never knows how time-consuming it’s going to be!). I went through stacks of crochet books about love knots, star stitches, and Tunisian lace methods in earlier years. Below is the list of seventeen knit and crochet books that helped me in some way. They’re in alphabetical order by title. I starred the ones that I recommend the most (about stitch games/pooling techniques). The list doesn’t include a few articles and websites I also used. Thank you so much for this fabulous list of references! I am finding the starred references to be particularly interesting and information packed on how to think about and bring out the beauty of variegated yarns – what fun!